SnoreMD Pro Review - Does It Justify the Price Tag? The big thing I noticed with SnoreMD Pro was the price. It’s definitely more expensive than most mouthpieces I’ve reviewed (though still a fraction of what you’d pay for one from a dentist), so the big question is it worth the cost? In my case in was very effective, though it’s not perfect. SnoreMD Pro is a great mouthpiece, overall I really like it and recommend it. The one concern is the price, it has a higher price tag than many of its competitors. The fit, effectiveness, and ability to adjust are standout features, plus the company is transparent and has a solid reputation. 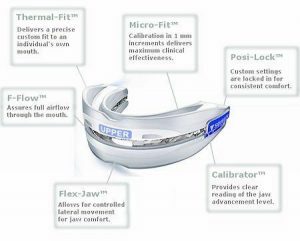 SnoreMD Pro is classified as a mandibular advancement device (MAD). It is designed to hold the lower jaw in an advanced position to help prevent your tongue from collapsing into your throat. In doing this it reduces the risk of soft tissues falling close enough together to vibrate and cause the dreadful snoring sound. Not to mention, when your airway is kept free of obstruction, your body gets the proper oxygen it needs throughout the night to allow for a more restful night’s sleep. When it comes to advanced features, SnoreMD Pro certainly has all the bells and whistles. This American-made product has a sleek design and all medical-grade copolymers and components. There are no uncomfortable acrylics, screws, rubber bands, rods, or torsion, and it has a built-in cushion to be gentle on your teeth. The design of SnoreMD Pro is supposed to allow you to talk, drink, and breathe through your mouth while wearing it. There is a generous size air gap separating the upper and lower portions. This also minimizes the claustrophobic feeling some get wearing certain mouthpieces. Micro-Fit – SnoreMD Pro allows you to make changes to lower jaw placement in 1 millimeter increments for a more tailored fit. Posi-Lock – You don’t have to worry about your desired setting coming loose in your sleep because it gets locked into place, so it won’t move all night. Calibrator – Instead of trying to remember what setting you had it on after you take it part to wash, you can easily find your setting of choice as long as you look at the calibrator before you take it apart. It provides a clear reading of your precise advancement level. 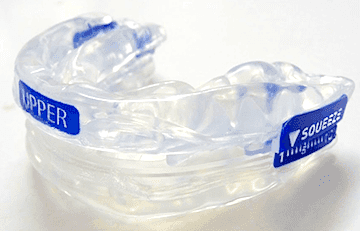 Flex-Jaw – For maximum comfort, Flex-Jaw allows for small lateral movements. F-Flow – To ensure proper airflow all night the F-Flow allows you to breathe fully. This makes it ideal for those with nasal polyps, deviated septum, or sinus issues. Thermal Fit – You are able to customize your mouthpiece to form to the curves and crevices of your mouth thanks to this feature. You may experience a little sticker shock at SnoreMD Pro. It is regularly $199, but currently you can get it for $149. Shipping is free and orders are typically shipped USPS First Class within 48 hours. You do have 30 days to decide if this is the product for you. If not, you can get a 100 percent refund. Ordering from the site is secure. It is a verified merchant through authorize.net. It is also a Doctor Trusted website. It has an A rating and was reviewed December 16, 2013 by Dr. Daniel Hanley M.D., M.S. of Chicago, Illinois. SnoreMD Pro looks really good on paper. Even writing about it makes me feel like it should be one of my favorites. It is attractive (not that appearance should matter), and it is loaded with some great features. It is definitely one I was looking forward to trying yet it didn’t make my list of favorites. First, ordering two of these (one was for my wife), put a serious dent in my wallet. 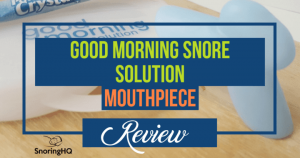 I can somewhat justify the price considering it has advanced features you would expect to find in a prescribed stop snoring mouthpiece. However, even justifying it didn’t make me feel that much better, but I figured if it ended up being the perfect mouthpiece it would be well worth its price. I will say that shipping was fast. I ordered first thing in the morning and already had a shipping confirmation later that day. When they arrived I cleaned them using a toothbrush and toothpaste. I already found one thing I didn’t like about the device: cleaning it was a pain. There are a ton of tiny crevices on this thing that you really have to put forth the effort to make sure it is clean, especially after you wear it and it’s full of bacteria. We used the boil-and-bite process to mold the mouthpieces. The instructions suggested wearing the device around the house a few hours at a time for a couple days. However, since we had previously tested so many MADs, we felt we could skip this step. The first night, I advanced my lower tray 3 millimeters and my wife did her mouthpiece 2 millimeters. Setting it was quite easy. You simply squeeze the sides where it says “squeeze” and slide the tray. When you release your grip it locks. I expected it to offer a strong click or something at every increment to know how far you had advanced it but the click was really faint. Plus, if you move too fast you miss them. Not a deal breaker by any means, but not quite as straightforward as expected. When we put them in before bed, we tried to talk and drink water while wearing them. The site says the design allows you to do these things, and you certainly can but with very little success. I suppose if you tip your head back and let someone pour water through the hole while you swallow it might work. I dumped water all over the front of me from a glass and a bottle. Perhaps, I’m a little overly judgmental because I had previously tried ZQuiet, which is a flexible mouthpiece that really does allow you to talk and drink. Maybe I have been spoiled, so I was disappointed in SnoreMD Pro. During the night, my wife elbowed me to roll over. Clearly, I was snoring, but it had not heard her make a sound and she fell asleep before me. I figured I probably needed to advance the lower portion of the mouthpiece a little farther, but I was not fussing with it in the middle of the night. So, I tossed it on the nightstand. My wife was full of energy and felt great the next morning, while I had to hit the snooze button three times. You don’t realize how miserable you feel the morning after you snore all night until you go without snoring for a while. Since I was running late, my wife cleaned our mouthpieces. She complained the entire time, which I knew she would. All those incremental crevices are challenging to clean. The second night, I changed the setting to 5 millimeters. I thought about doing 4 millimeters, but figured it wouldn’t make that much difference. I was wrong. I did not snore all night, but my mouth sure was sore the next day. On the third night, I moved the setting back one click and it ended up being just right. It was far enough to stop the snoring, but not so far that my mouth was too sore to talk the next day. The device worked to stop my snoring for the remainder of the trial and the soreness ended on the fifth day. SnoreMD Pro is a great mouthpiece, really the only concern is the price. If some of the advanced features spark your interest, then this is definitely the mouthpiece for you – it has some things that no other mouthpiece at this price point can compete with. If you are looking for a cheaper option, you may want to start with Zyppah. SnoreMD Pro was effective for my wife from the first night, but with me it took three nights to find the right setting, In my opinion it is the best option if you have a little extra money burning a hole in your pocket and you are looking for one loaded with cutting edge features.